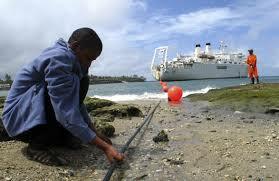 17 global operators have drawn an agreement to launch a high capcity undersea broadband cable system connecting Europe, Asia and Africa. The project is set for completion by 2016 and its expected to provide capacities of upto 40 terabits. AAE-1 (Asia Africa Europe-1) shall span 25,000 km from Hong Kong to France. Construction of the AAE-1 is expected to provide the demanded capacity due to growth of cloud computing and CDN (content delivery network) services. The AAE-1 consortium members include Saudi Arabia’s Mobily, Telecom Egypt and China Unicom.